The Fumo Pipe is nothing less than an innovative smoking device. Flawless functionality, appearance and taste! A mix between a pipe and a steam roller. Light it like a pipe and clear it like a steam roller. Smoke is cooled within the billet body, which acts as a natural heat sink. Fill the chamber to the volume you desire then when ready push the button and a rush of fresh air comes through to clear the chamber. * Storage compartment under the bowl. 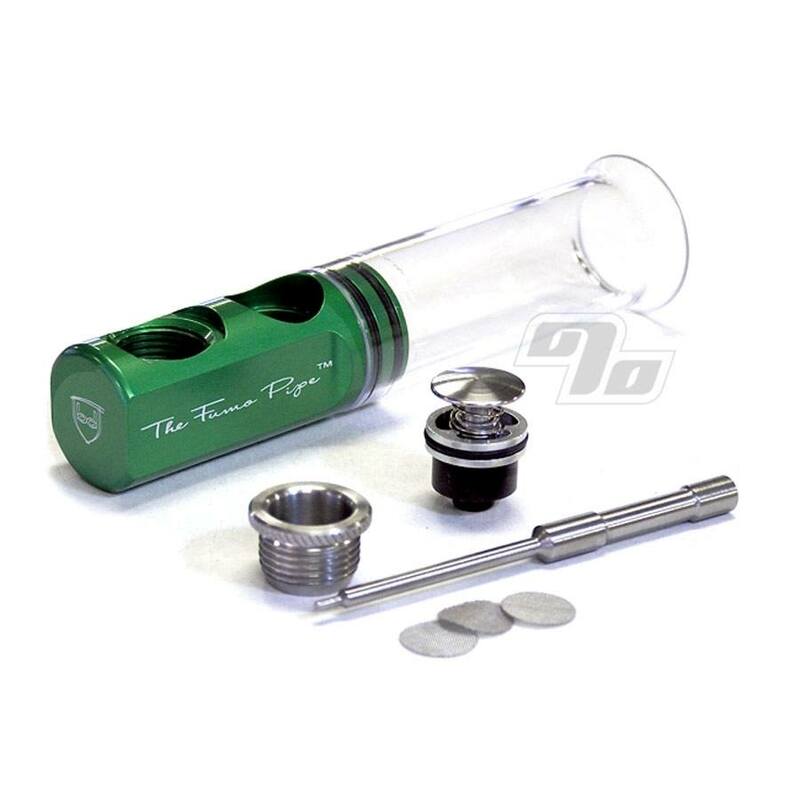 The Fumo Pipe was thoughtfully designed and has been thoroughly tested for function. Easy to use and super easy to clean and simple one handed operation. Fumo Pipes come in a variety of colors. Upgrade anytime with extra long tubes and party bowls; for those who like to share with a group. All Fumo Pipe extension tube chambers are manufactured from polycarbonate making them super strong! The polycarbonate is extremely impact resistant creating a tube chamber that will not crack or break when dropped. Standard tubes are 3 inches long and 1 inch in diameter and are super easy to clean. Longer tubes are available from 6 inches all the way up to 18 inches. The Fumo Pipe can be disassembled, cleaned and re-assembled in about a minute. You simply unscrew the bowl, pull out the button-carb mechanism, remove the chamber tube and run your cleaner through the pipe. Then simply put the chamber tube back on, install the button-carb mechanism, and screw the bowl back in. Great little pipe! You won't be disappointed. Good pipe. Clean smooth hit. Delivers a pure, smooth hit every time. Easy to clean too! Well made, easy to take apart to clean, nice clean smoke. Owned my Fumo for about 2 years and liked the overall performance. I did not like the need to clean it every three or four smoke sessions. If you own more than one pipe and add this to your rotation; expect to clean it before every use or after your last go .... the oils set-up very quickly in the carb & seals and require continual attention to clean. Go glass, stay glass. Awesome pipe! Added to the collection and love it. Hits hard, very well made. Longer tubes and glass bowl available too. 1percent.com was a great shopping experience, fast shipping and zero problems.